Richard Watson Court located at 577 East 8th Avenue is an existing 39 suite apartment complex. There are 27 one bedroom units and 12 two bedroom units, many of which have been modified to accommodate disabled persons. There is an elevator, laundry room and secure underground parking for 41 vehicles. The subject property is located at the corner of East 8th Avenue and Carolina Street in the Mount Pleasant neighborhood of the City. The building is well situated on a quiet street close to transaportation/shopping and offers easy access to downtown. Mount Pleasant is rapidly gaining popularity with its proximity to amenities and transportation routes. 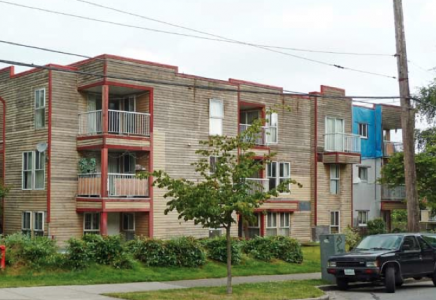 There has been extensive envelope failure in the building resulting in an order to “Cease the use of all balconies” by the City of Vancouver. There are no doubt other significant structural and cosmetic issues that require attention. Building inspection reports will be made available upon request.